While it’s true I grill most of my doves, frying them is every bit as good and is a nice change of pace. 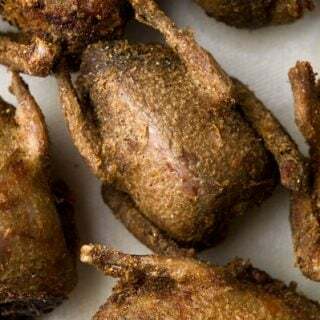 I initially came up with the idea for this dish after reading a 1940s recipe for deep-fried doves in Roy Wall’s Fish And Game Cookery. His recipe is old school, with the doves fried in shortening and served with a Southern milk gravy. Good, but not my style. I prefer this Cajun style, and as finger food, with no gravy. 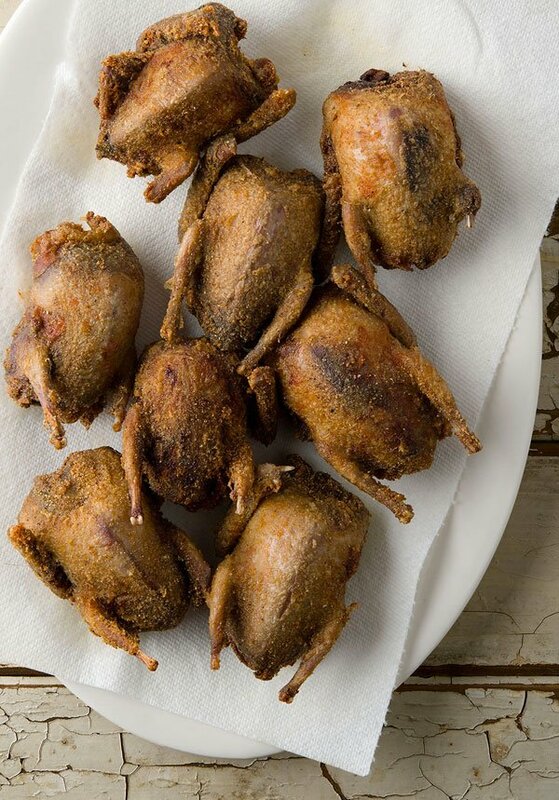 All that means is you dredge the little birds in corn flour — basically Louisiana fish fry mix — with some Cajun or Creole seasoning, and fry in peanut oil. Damn good. Another alternative is to go Middle Eastern, Turkish, really. I like frying things in chickpea flour, which is available in good supermarkets, Italian and Indian stores. You could substitute in some other earthy-tasting flour: The easiest alternative would be whole wheat. I’ll lace the flour with a typical mixture of Middle Eastern spices: garlic, chile, cumin, sumac and fenugreek. You could do any kind of spice mix you want. Just don’t go with a thick batter, which gets in the way of enjoying the doves. 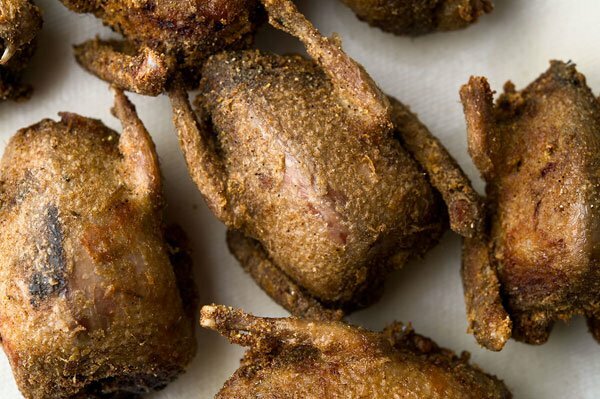 Doves are my usual bird for this recipe, but any small bird will work. Quail is a great choice, would a partridge or young pigeon. What to serve this with? Rice is nice, like a jambalaya or even just white rice. A salad is another good option, like a tomato salad or one with roasted red peppers. But mostly I just eat these as appetizers for a party. Wash the doves and set aside at room temperature for 30 to 45 minutes. Pour the oil — I use canola or peanut or cheap olive oil — into a deep-fryer or heavy, high-sided pot like a Dutch oven. A fryer will have a fill line. Pour no more than 2/3 of a pot’s depth, and half is better. Don’t worry, you can reuse the oil. Heat the oil slowly, over medium heat, to 350°F. If you are using olive oil, keep it at 340°F. Meanwhile, mix the flour or cornmeal and all the spices together in a bowl and coat the doves. Make sure you get it into the cavity, too. When the oil is hot, drop in a couple doves at a time and let them fry for 5 to 7 minutes, turning them to be sure they are golden brown all over. Let drain on a wire rack in an oven set to ‘warm.’ Serve with a bowl for the bones and give your guests plenty of napkins. Here is the remoulade recipe I use for the Cajun option. Looks awesome. Probably going to do his with the 6 whole birds I have plucked in the freezer. As far as milk gravy goes, I wholeheartedly agree with you Hank. When I moved to Memphis from Canada 16 years ago, I was taken aback by the white gravy everyone served down here. 16 years later, I still haven’t acquired a taste for it. My husband bagged a good lot of dove this weekend. I’ll be trying this recipe tonight.